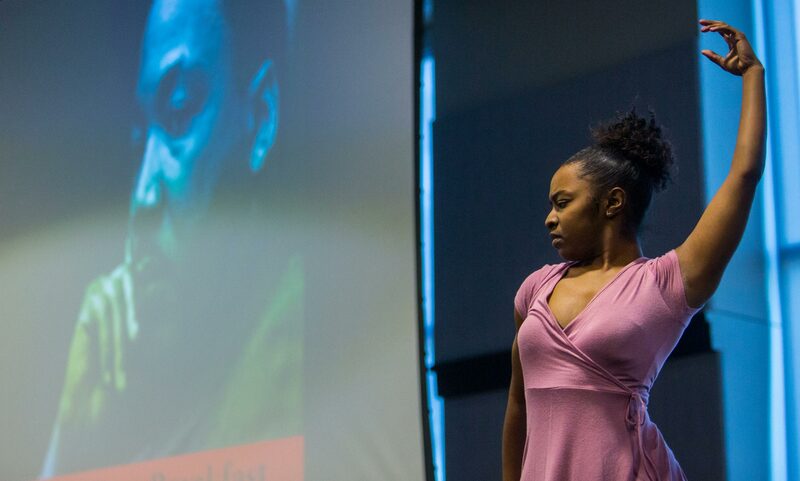 A dance student performs during the TAASU Freedom Breakfast. How has the African American experience on the University of Missouri-Kansas City campus evolved over the past half-century? Come hear three unique perspectives at the 29th annual Freedom Breakfast sponsored by The African American Student Union (TAASU). The speakers will represent the experiences of three different generations: Margaret A. Evans, Ph.D. (B.A. ’71, MPA ’72), one of the original founders of TAASU; Michael Watson, who attended UMKC in the 2000s and is one of the most stellar student-athletes in the history of university; and the current president of TAASU, Cameron Johnson, a junior majoring in biology with a minor in chemistry. The program will also feature special tributes from UMKC students. This year’s breakfast celebrates the 50th anniversary of the founding of TAASU. Proceeds support the Herman Johnson Scholarship fund and TAASU leadership programming opportunities. The TAASU Freedom Breakfast was created not only to commemorate the legacy of Martin Luther King, Jr., but also to promote unity and harmony within our UMKC community. The event highlights UMKC’s institutional values of diversity, inclusiveness and respect. Tickets and registration are available online. These speakers will provide insight to how the African American experience on the University of Missouri-Kansas City campus has evolved over the past half-century. Margaret Evans (B.A. ’71, MPA ’72) received the 2009 UMKC Defying the Odds Alumni Award, honoring the heartbreaking, yet triumphant story of her life. As an undergrad, she worked full time while simultaneously juggling a full class load. When her father became severely ill her junior year, she had to work two jobs to pay for his bills and became his full-time caregiver. He died a few months before she graduated. Margaret credits her Alpha Kappa Alpha sorority sisters as well as friendships she made with her fellow TAASU members for helping her get through the difficult time. In graduate school, Margaret became the recipient of a Ford Foundation Fellowship, which freed her from financial worry. She was also the first African American female student at UMKC to go through an accelerated program, which allowed her to earn her MPA only a year after her undergraduate degree. She also has a Ph.D. from Kennedy Western University. Michael Watson is a native of Kansas City, Missouri, where he graduated from Central High School. While at UMKC, Watson enjoyed a record-setting basketball career. He finished as both UMKC and the Mid-Continent Conference’s all-time leading scorer with 2,488 points. Not only was Watson a stellar basketball player on the court, he also established himself as a prominent community member and role model off the court. Watson began his professional basketball career in 2004 as a free agent with the NBA’s Boston Celtics. After his rookie campaign in the NBA, he went on to play eight years in professional leagues in Poland, France, Italy, Turkey and Puerto Rico. While playing abroad, Michael gained valuable experience interacting with people from different cultures, belief systems and socio-economic backgrounds. Those experiences motivated Watson to champion positive change in his own hometown. In 2011, he returned to Kansas City where he helped establish the Urban Ministry for the Fellowship of Christian Athletes. He is currently the executive director of the Raytown Emergency Assistance Program (REAP) where he helps families with utility, rental and food pantry assistance. He remains close to the game he loves as a high school and college basketball television color analyst. Cameron Johnson, a St. Louis native, is a junior pursuing a bachelor’s degree in biology with a minor in chemistry. His campus involvement includes serving as president of TAASU and vice president of the Men of Color Campus Initiative. He is also a spring 2018 initiate of Alpha Phi Alpha Fraternity and a scholar in the UMKC African Americans Cultivating Excellence (AACE) program. Over the past few years, Cameron has served as an intern for various youth programs such as Boys and Girls Club, Teach for America and Children's Defense Fund's Freedom Schools under the guidance of the Deaconess Foundation in St. Louis. During these internships, he developed a deep passion for uplifting youth and has decided to pursue a career as a pediatric surgeon, along with striving to create youth development programs centered around molding the next generation of black and brown leaders in STEM.